Most hotels, if around long enough, go stale after awhile. New, they attract a certain type of traveler and when that type of traveler ages, so does the hotel's concept, décor and bedding. Lately, though, there's been a scramble to "re" - renovate, refresh, repurpose, as well as build from scratch - boutique hotels in Northeast US cities. These new and renewed hotels cater to a modern explorer: one who prefers a social atmosphere, a sense of place, and playful, stylish design. Though the list can change by the day, the following ten hotels in Washington DC, New York City, Boston and in between represent the best among new and renewed boutique hotels to open or reopen within the past few years. (For more on each hotel, and other great destination ideas in the Northeast US, check out GetawayMavens.com). 1. The Pierre, A Taj Hotel, Manhattan. 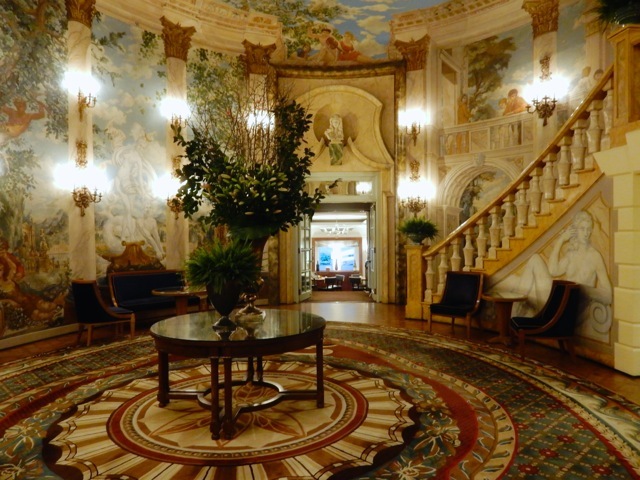 The Pierre was one of New York City's original "boutique hotels" when it opened in 1930. After undergoing a recent $100 million renovation, the Taj Pierre is lovelier than ever, and ever graceful. Located on what is arguably the most photographed and filmed section of Manhattan, the southeast corner of Central Park on 5th Avenue, it's within steps of Central Park Zoo, the Wollman Skating Rink, and a slew of fancy horse-drawn carriages. The epitome of "Romantic New York," The Pierre/Taj is quiet, lavish without being showy, and exceedingly elegant, all with that nearly extinct commodity: a friendly, anticipatory, human touch. Within sight of the Plaza Hotel, it's is often overlooked but shouldn't be: newly refreshed, the Pierre/Taj is a Classic in the best sense of the word. Rooms from $560. 2. NU Hotel, Brooklyn NY: Lodging options are rolling out in Brooklyn at a frenzied pace, servicing a growing number of business and leisure travelers who prefer distinct neighborhood flair to a cookie-cutter anyplace experience. 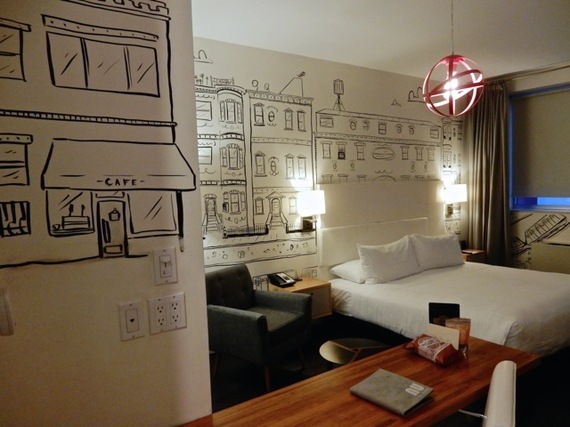 Boutique hotels are distinguishing themselves by offering tasty locally made delicacies, and by inviting Brooklyn artists to use guestroom walls as canvas and public areas as art galleries. The new NU Hotel - a comfy, upscale small hotel in the Cobble Hill section of Brooklyn is one of the best of these: playful enough to attract hipster tourists, but sufficiently sensible for a growing number of business travelers. For the most artsy experience, book one of the larger NU Perspective rooms - a series of 14 guestrooms (with more coming) dolled up by muralists and painters. One of these, the sizable Room 303, features espresso hued hardwood floors, industrial desk with ergonomic rolling chair, large floor to ceiling mirrored sliding closet door, cloudlike king bed - and, covering most walls, artist Steven Weinberg's black and white renderings of Brooklyn streets. Rooms from $220. 4. 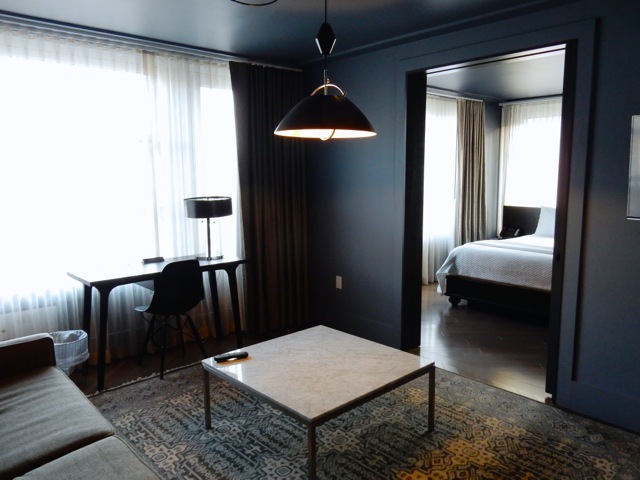 BROOKLYN, A HOTEL, Brooklyn: "Don't judge a book by its cover," says one reviewer of the 34-room The Brooklyn, A Hotel, opened in August '15 on Bed-Stuy's commercial Atlantic Ave. And so, you'll have to call upon your free-spirited luxury-hotel seeking mojo for this one. Whether you drive in and park at the $8 per night open lot at the end of the block, or walk from the subway station, you'll be faced with cracked sidewalks, Long Island RR trains that run down the center of the street, and graffiti-laced buildings until, that is, you arrive at the double glass front door of The Brooklyn A Hotel - and then it's another ballgame. 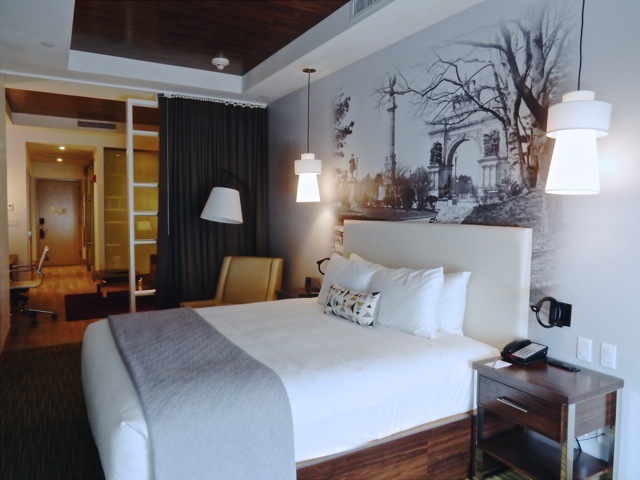 Guestrooms are a textural mélange of red brick wall, polished hardwood ceiling, cream-colored walls, ecru leather chairs, large floor lamps, large flat screen TV and soft, dreamy bedding. Bathrooms are Porcelanosa-tile cool, in shades of grays and tans, with frosted glass sliding doors, rain showerheads, and modern fixtures. Rooms from $175. 5. BKLYN House, Brooklyn: These days, a formerly forlorn neighborhood earns trendsetter status when a funky boutique hotel opens in its midst. And so, herewith, Bushwick's BKLYN House Hotel, where "provocative street art and fine art live side by side." 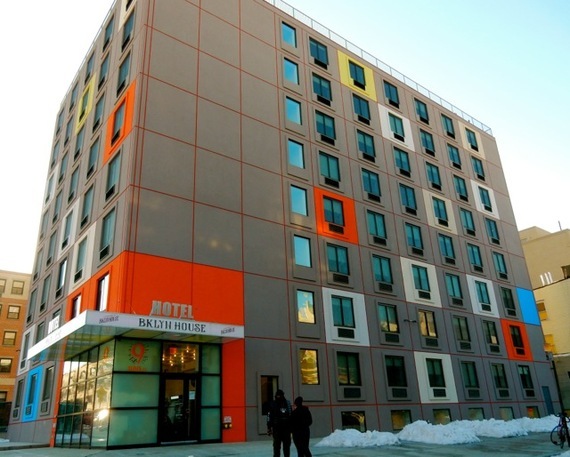 For travelers visiting friends or family nearby, the 116-room BKLYN House offers a clean, artsy, upscale-hostel-like budget option in this transitioning section of Brooklyn. The Business Center - several desktop computers, printers and fax machines a few steps down from the lobby - also serves as an ersatz art gallery, representing local work with a Brooklyn theme. 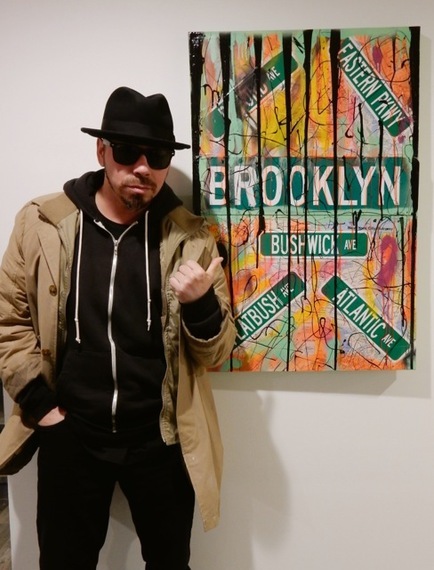 Every piece of art, like street sign pop art by upbeat Bushwick-booster and exhibit curator, Savior Elmundo, somehow references this borough of NYC. From $99 per night. 6. Z NYC Hotel, Long Island City NY: It's not just the astounding view from each compact, artfully designed room at the Z NYC Hotel that wows you when you walk in. It's also the way that the 59th St. Bridge - the span that inspired Simon and Garfunkel's "Feelin' Groovy" (also known as the Queensboro or Ed Koch Bridge) - the East River, Roosevelt Island, FDR Drive, and the sturdy buildings of Midtown Manhattan beyond, framed through floor to high-ceiling windows, contorts your mind into thinking that you're anywhere but in that least respected of NYC boroughs, Queens. 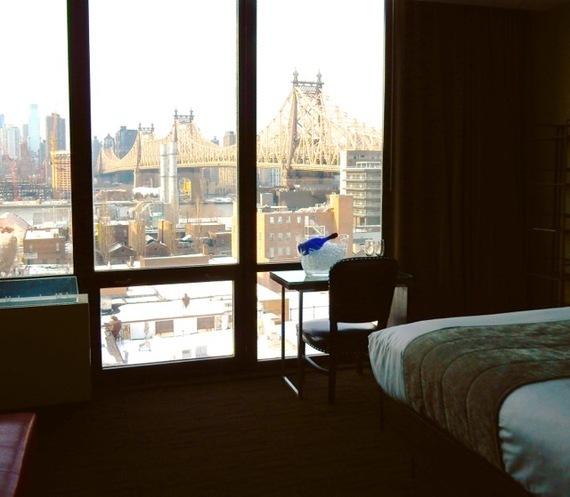 But Long Island City's Z NYC Hotel offers some of the best skyline views of Manhattan from anywhere (be sure to ask for a room on 6th floor and up), and it's only a five-minute subway ride to 63rd & Lex. Rooms from $95 per night. 7. J-House, Greenwich. The J-House, originally a just-off-I-95 Howard Johnson's that had become an eyesore, was recently rebuilt as a sleek, fashionable, enviro-jazzy luxury boutique hotel. All 85 "automated" high-tech impeccably cool rooms and suites are outfitted with 55" flat screen TV's, I-Pads that control temps and light, pillow top teak platform beds clad in white, rainforest showerheads, tvs embedded in mirrors, and space-age remote control Japanese toilets. It's state of the art meets art of the State, as common areas incorporate the work of local contemporary artisans and video whizzes. Rooms from $229. 8. 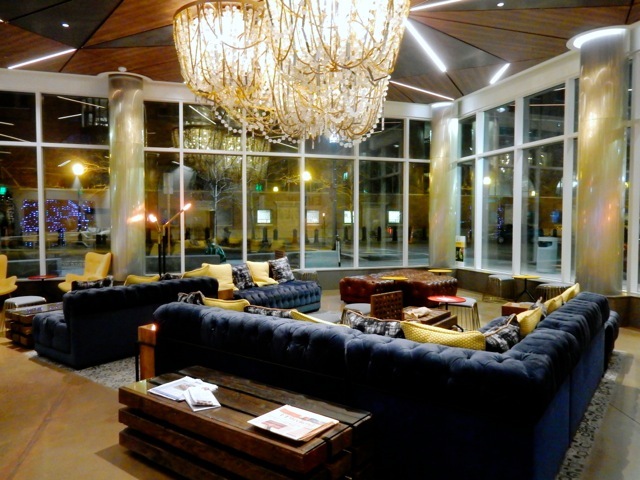 Envoy Hotel, Boston MA: Opened in June 2015, the 136-room Envoy, a Boston Seaport Autograph Collection by Marriott Hotel, became an instant sensation. It's easy to see why. 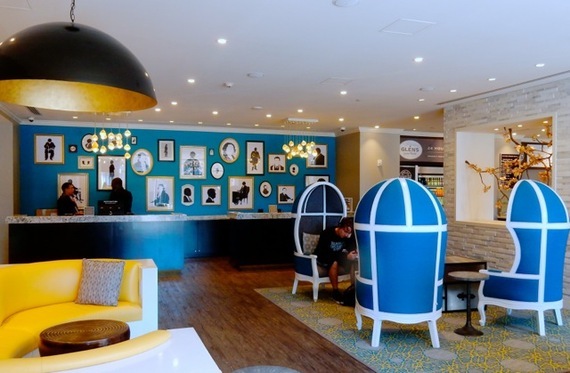 Built from the ground up (as opposed to Marriott's typical Autograph property carved from an existing historic building) overlooking Boston Harbor, the Envoy amuses with whimsical décor and astounds with the latest in interactive high-tech accoutrements and modern luxury. Sunlight pours through floor to ceiling windows in the lobby, illuminating clusters of gold and blue seating, and fabulous "Treasure Chest" chandeliers, designed to look like tangles of ropes and baubles being pulled from the sea. The focal point of each room, composed of whitewashed walls, HD-TV bicycle, and "floating bed," is the bank of floor to ceiling windows offering views of the harbor. Instagram-worthy bathrooms are beautifully fashioned mini-spas - each featuring a rolling glass door stamped with a map of Boston that serves as the sole piece of art in an otherwise minimalist room. Stunning. Rooms from $310. 9. Aloft Hotel, Boston MA. 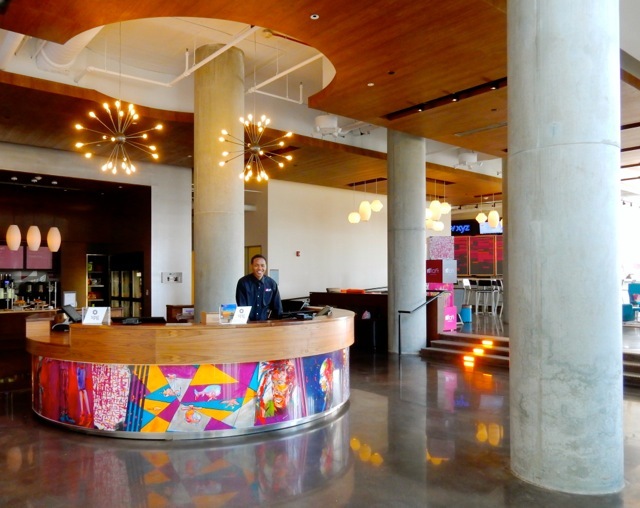 Though larger than most boutique hotels, Aloft Boston Seaport is trendy, a bit edgy, and vibrant. Concrete columns, polished poured cement floors, exposed pipes in the ceiling: this is the highly social, amenity packed warehouse loft apartment that Millennials want to move into. Though rooms are small, they are well designed with punches of color and in the soaring, buzzing lobby, a pool table is constantly in use, guests text on cell phones from brightly colored mid-century modern chairs, and the WXYZ Bar (open 5pm-Midnight daily) draws guests for cocktails and small bites. Rooms from $220. 10. Embassy Row Hotel. On a foreign Embassy-lined street, steps from DuPont Circle, what is now Embassy Row Hotel had eased into decline before new owners took over in 2014. By April 2015, Embassy Row (not to be confused with Embassy Suites) was gutted, spiffed up and modernized- and now merits an esteemed spot in Washington DC's constellation of top hotels. 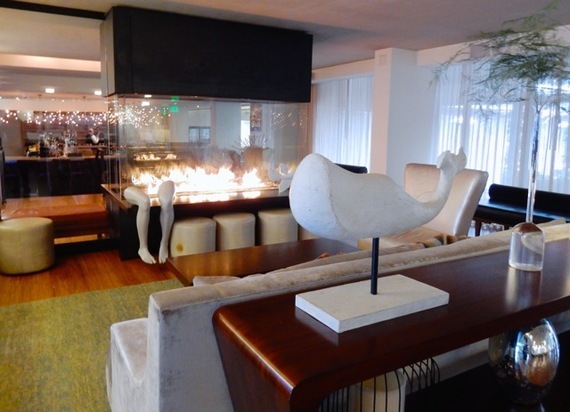 The eye-popping lobby is imbued with all the winning elements of a contemporary boutique hotel. Blue "egg" chairs, canary yellow banquettes, and clusters of cool seating with sculptural silver coffee tables invite conversation. Black cut-paper silhouettes of US Presidents behind the reception desk pop on a bright teal wall. Stairwells walls and elevator doors show off work of famous graffiti artists. And the fantastic rooftop lounge, pool and Yoga deck entice locals and a growing number of urbane travelers. As General Manager, U.S. Marine, Shawn Jervis, partners with veteran-owned products and services, such as the local Cherry Blossom Creative for printing, and Compass Coffee, a company launched by two DC-born Marines, as sole source of java for Embassy Row's in-house Station Kitchen & Cocktails. Rooms from $200.